In the second part of our core workout series, you practiced stabilizing your body by holding five positions. 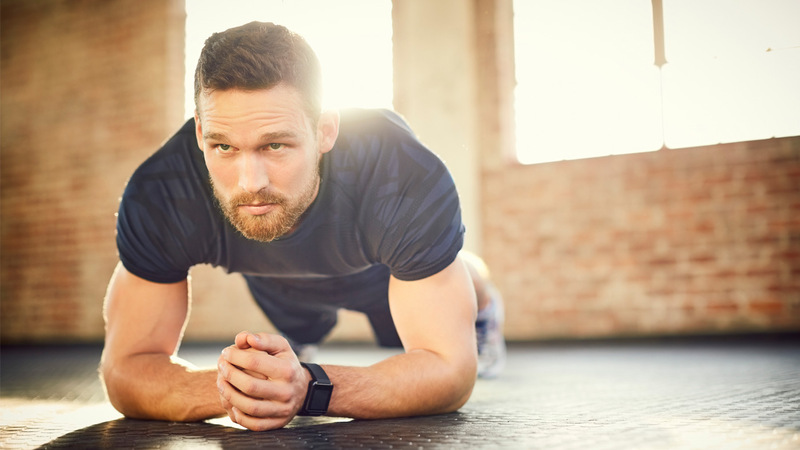 Gold’s Gym Fitness Expert Adam Friedman says that in this stage of the progression, you should begin to notice that you’re feeling stronger in other movements. This third part of the series builds on that strength and stabilization by incorporating motion. Before advancing, Friedman says reassess the foundational core moves. “Some people challenge themselves too quickly and the body tries to make it easier by breaking proper posture,” he says. “If you go back and do the fundamentals well — controlled activation of muscles and breathing — then, great. If you find you’ve lost some of that, spend a little time progressing on them again. Review each position in the previous installment, Core Progression: Build Endurance, before adding the movements described below. This is a variation of the core brace detailed in the second installment of this series. Hold the brace with your hands under your lower back. Maintain equal pressure while lifting one bent knee 90 degrees, then lowering it and lifting the other. The goal: Do 30 reps (15 on each leg). Start with 10 reps on each leg and progress as you’re able. This is a variation of the core bridge from the second installment. Apply the same alternating 90-degree knee raises as above, keeping the hips from rotating from side to side while maintaining the pelvic tilt. A more advanced bridge can be used as a variation to the alternating march: the single leg bridge hold, with the knee in that 90-degree lift. The goal: Do 30 reps (15 on each leg). Start with 10 reps on each leg and progress as you’re able. For the single leg bridge hold, start by holding the position for 20 seconds on each side and work up to 30 seconds. Begin on your hands and knees. Trying to keep your knee facing the floor, circle one knee clockwise three times and counterclockwise three times, with the back of the opposite hand resting on the small of your back. Then switch sides. The point is to isolate the movement so that just your hips are doing the work. At first, this may limit the range of motion of your knees. Don’t force it; circle only as wide as you are able before the body tries to make it easier by breaking proper posture or involving your back to help widen the circles. The goal: Do 3 reps in each direction, on each side, at full range of motion. Shift the hips from side to side without rotating. Rotate the hips, tilting each side toward the ground without moving the feet, shoulders and head. Pause in the center between each tilt. Alternate leg raises, lifting each off the ground without moving any other part of the body. If you have access to a stability ball, another advanced variation is to hold a plank position with your forearms on the ball instead of the ground. The unstable surface automatically challenges core strength. The goal: Do 15 reps of each move on each side. Begin with 10 reps and work your way up. Then, if you’re able, change to a straight-arm plank position (on your hands instead of your forearms) and work up to the 15 reps. The straight arm position automatically requires more stability from the core. With the upper body braced, isolate the hips by lowering them to the floor and then raising them back up. Pull the knee of the top leg forward at 90 degrees and hold. The goal: Do 15 reps of the hip raises on each side; start with 10 and work your way up. Hold the knee at 90 degrees for 20 seconds on each side; progress up to 30 seconds. Then, if you’re able, try doing these moves in a straight-arm position.